This is a work-in-progress feature. Please expect major improvements in the coming months. // The user rejected the paste request. As you can see in the code above, the object is not strongly typed, meaning that the compiler has no way to know what type is expected by the "copy" method, and what type is returned by the "paste" method. However, if the library comes with a "TypeScript Definition" file, or if you can create one, those issues are solved. In fact, the "TypeScript Definition" file will add strong-typing to the library, making it possible to have intellisense, compile-time error checking, and even direct calls to the library from C# thanks to the CSHTML5 processing explained below. By looking at the code above, you can see that the "TypeScript Definition" file tells the compiler that the "clipboard" object has two methods, that the method "Copy" expects a string, and that the "Paste" method returns a Promise<string>. How can I use a TypeScript Definition file in my CSHTML5 project? Simply add the TypeScript Definition file to your CSHTML5 project and the compiler will automatically take it into account. 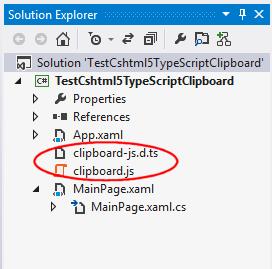 Click HERE to download a sample CSHTML5 project that demonstrates the use of the "clipboard.js" and "clipboard-js.d.ts" files, as explained above. Content="Click to copy some text to the clipboard"
Content="Click to paste from the clipboard"
What happens exactly when I add a TypeScript Definition file to my CSHTML5 project? The generated C# classes are located in the folder "obj\Debug\FILENAME\" (where "FILENAME" is the name of the TypeScript Definition file). //     lost if the code is regenerated. To force re-generate the C# files from the TypeScript Definition, manually delete the file "TypeScriptDefInfos.xml" that is located in the "obj\Debug" sub-folder of your project folder, and re-build the project. If the TypeScript Definition file is very big, it may take several minutes to compile. This is normal and only happens during the first compilation. You can comment out unused portions of the file to speed the compilation up. We plan to add a progress bar in a future version. When a TypeScript Definition file is open in a tab in Visual Studio, many misleading errors may be displayed, and some TypeScript code may be underlined even though it is perfectly correct. To see only the "real" compilation errors, be sure to always close the TypeScript Definition file and re-compile. If you encounter any issues during the compilation of a TypeScript Definition file, please contact us. As a temporary workaround, you can comment out the portions of the TypeScript Definition file that do not compile properly, and try again.